Almost a third of the new Nord Stream gas pipeline has been laid across the Baltic Sea. There is, however, growing opposition to the pipeline — and Brussels is having difficulty figuring out how to deal with the project. Initially, it was mainly Ukraine and Poland that objected to Russia's plan for a second natural gas pipeline crossing the Baltic. The Polish Foreign Minister Jacek Czaputowicz said recently that the project "will kill Ukraine." Once Nord Stream 2 is laid, Russia will be able to supply a lot more natural gas to Germany directly, and from there to other Western countries. And Poland believes that when Russian gas no longer has to be exported via Ukraine, the country will no longer be guaranteed protection against further Russian aggression. 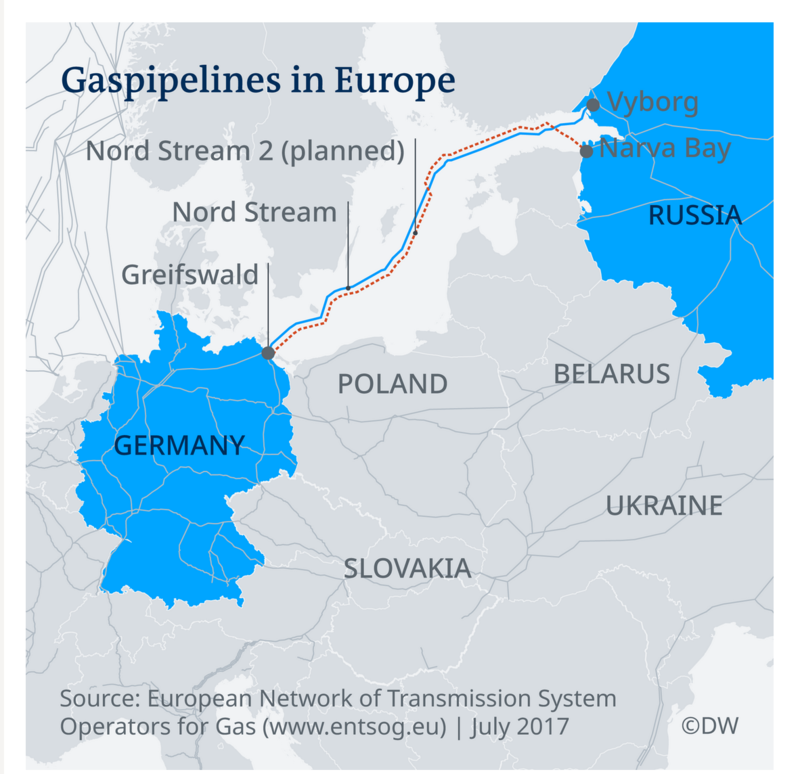 According to Kay-Olaf Lang from the German Institute for International and Security Affairs, Warsaw also sees the Nord Stream 2 pipeline as a symbol "of German disloyalty towards its eastern neighbor, and of a special relationship with Russia." For a long time, this criticism was simply ignored in Berlin, but it's taken on another dimension since the US also started exerting pressure, from US President Donald Trump warning of potential German energy dependency on Russia and the American ambassador in Berlin, Richard Grenell, threatening sanctions if Germany keeps course. Washington is clearly losing patience: "Now is the time to negotiate," a high-ranking US government representative told DW. "Once the pipeline has been completed, Europe will lose its margin for maneuver with Russia." But the German government believes that what this is really about is business interests. The US wants to sell its own liquid gas to Germany. The German minister for economic affairs and energy, Peter Altmaier, hasn't ruled out importing from the US, but only to supplement Russian gas, and only if the price is right. For Russia, on the other hand, the gas pipeline is a strategic project. The country has been pushing back against criticism, with Gerhard Schröder, a former German chancellor who now manages the Nord Stream 2 project, doing much of the work. Russia subsists, to a large extent, on its natural gas exports — and the Kremlin wants to keep the profits, not share them with other countries. It also doesn't want Ukraine, Poland and other countries to be in a position to interrupt supply. Moscow may be prepared to make concessions to Ukraine if criticism continues to grow, but only while the project is still under construction. Once the pipeline is completed, Russia will be in a position of strength, which will enable it to ignore not only Ukraine's interests but also those of other eastern European countries. Former German Chancellor Gerhard Schröder has been criticized for his enthusiastic involvement in the pipeline and his frequent cozying up to Russia's Putin. Nord Stream 2 is also an issue for the European Union. The European Commission has the difficult task of finding a solution for the EU as a whole, given the conflicting interests involved. In 2016, EU energy commissioner Miguel Arias Canete actually said straight out that Nord Stream was not in the interest of Europe as a whole. The Commission isn't openly trying to block the pipeline project, but it does want to make it an EU project, meaning it would be subject to strict EU competition rules. Any such decision requires the agreement of the European Parliament and the European Council of member states. The Commission has Poland and the Baltic countries on its side, as well as Britain, Denmark, Slovakia, Ireland, Sweden, Italy, Luxembourg and Croatia. Germany, Austria and the Netherlands, on the other hand, want to proceed with Nord Stream 2, preferably in its current form. Businesses from these countries are involved in its construction. One deciding factor could be the position adopted by France, which is still considering the issue. France traditionally sides with Germany, and its energy supplier Engie is also involved in the Nord Stream 2 project. It's therefore likely that Paris will support the German position. If Paris votes against applying EU common rules to the project, or if it abstains, the Commission will fail to achieve the necessary majority. Romania, which currently holds the presidency of the European Union, is trying to broker a compromise, but time is running out. European elections are happening in May. After that, a new EU Commission must be formed, and it probably won't be in place before November. Meanwhile, construction of the pipeline continues – and if Brexit happens as planned on 29 March, the Commission will lose, with Britain, one of the biggest supporters of making the pipeline into a common EU project. Blocking Nord Stream 2 does not seem realistic, but its opponents have for now at least won a partial victory. “Warsaw has succeeded in putting a project on the political agenda that for a long time was regarded as purely economic,” says the German Institute for International and Security Affairs' Kay-Olaf Lang. He comments that the opposition to Nord Stream 2 has contributed to it becoming an important element of the geopolitical discussion, not only in eastern Europe, but in Germany, too. In particular, opponents of Nord Stream 2 see Chancellor Angela Merkel's comment in April 2018 as confirmation of their position. After a meeting with the Ukrainian president, Petro Poroshenko, in Berlin, the chancellor admitted for the first time that the gas pipeline was “not only an economic but also a political project.” However, Wolfgang Ischinger, the chairman of the Munich Security Conference, has commented that this acknowledgement came very late in the day. Ischinger gave a newspaper interview in which he criticized the German government for not paying enough attention to the Eastern Europeans' concerns. For Poland, the Baltic states and Ukraine, this too confirmed their arguments. They’re hoping that Berlin will now listen to them after all.